Larter & Sons Art Nouveau lapis lazuli and gold gentleman’s ring circa 1905. Centering a bezel-set, buff-top lapis lazuli displaying beautiful blue color with small pyrite markings, between shoulders decorated with classical scrolling motifs, in relief, mounted 14-karat yellow gold with maker’s marks for Larter & Sons. Classic and masculine! Very pristine condition consistent with age and wear. 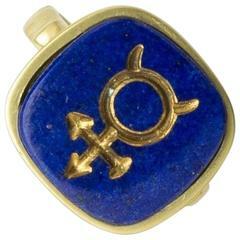 Treat Yourself to this outstanding lapis lazuli ring. Make Yourself Happy! And if that won’t be the case, make someone important in your life Happy with this fine ring as a token your loving care and affection. It will make you happy too. Knowing that you have chosen with love in mind. For over three decades we have been in the business of selling a carefully curated collection of antique and estate jewelry. 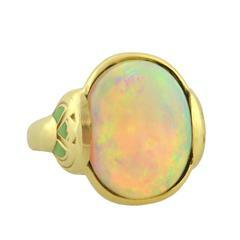 RING SIZE: approximately 9 ½. DIMENSIONS: approximately 11/16” wide vertical to the fingernail.